Laid back, devoted and brave, with occasional moments of strong-willed stubbornness, the English bulldog is good all-around companion for families and apartment-dwellers alike. According to an Encyclopedia Britannica article, the bulldog breed was developed in the early 13th century to fight bulls. 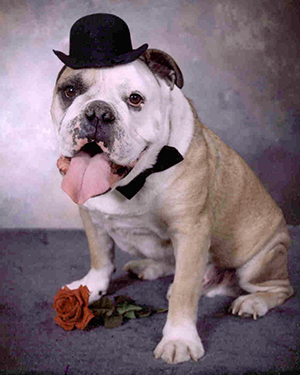 The English Bulldog descended from ancient mastiffs that originated in Asia and were brought to Europe. Both share traits of tenacity, courage, and determination. According to the American Kennel Club, when animal baiting contests were outlawed in England in 1835, the last of the working bulldogs in England were crossed with pug dogs to create a stocky, docile, family pet, known today as the English Bulldog. Sweet, loyal, and lazy, with a tendency to be stubborn. 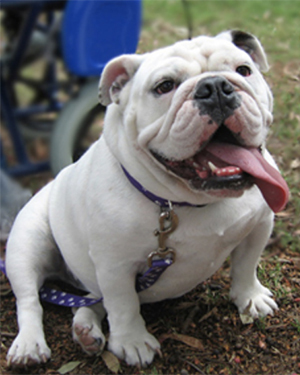 On average English Bulldogs weigh 50 pounds, and stand 15 inches tall at the shoulders. Any color except all black or black and white. Generally a couch potato, but do enjoy daily walks. On average, between 8 to 11 years. Older dogs generally good with well-behaved children, but dogs who are age 2 and under are too energetic to be recommended around small children. Bathing occasionally, daily cleaning of face wrinkles, ears and depending on the type of tail, the area under the tail needs daily cleaning. Possible elongated soft palate, small trachea, allergies, dermatitis, eyelid anomalies, hip dysplasia, and heart problems. 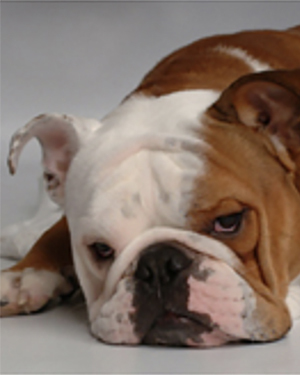 Owners must go to a vet that has specific experience with Bulldogs.